(a) Existing chlorophyll-a product when sunglint is present. Stnadard chlorophyll-a image on 12 June 2010 is contaminted significantly by sun glint. (b) New color index (CI) product. The new CI image on the same day is immune to sun glint and shows major circulation patterns. Understanding the connectivity between the ocean environment and upland ecosystems is critical for monitoring water quality and understanding impacts to marine ecosystems such as coral reefs. Remotely sensed ocean color products provide a mechanism to understand this connection and are proving to be a critical management tool for the Florida Keys National Marine Sanctuary and NOAA’s Coral Health and Monitoring Program. University of South Florida's Optical Oceanography Laboratory at the College of Marine Science is working with these regional ocean managers to generate a glint-free color index (CI) product for the SECOORA region and provide it via a Web interface. to map ocean chlorophyll-a concentrations, water clarity, and other properties. 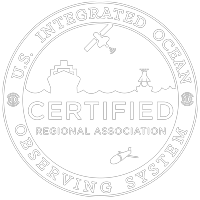 Such an approach has been used globally to study the ocean and coastal waters. But, in subtropical and tropical regions, there is often no data in the images due to sun glint contamination. This new product overcomes this difficulty and provides high-resolution color features to trace eddies and water circulation. Maximizing the spatial coverage of ocean color data is important because these color features are often not observable using any other means including sea surface temperature, sea surface height, and high frequency radar. The Integrated Coral Observing Network (ICON) Coral Health and Monitoring program uses the small-scale eddies observed from these new products to help monitor the hydrodynamics in the delicate coral ecosystem. The Florida Keys National Marine Sanctuary is using the color products to trace connectivity among various ocean and land ecosystems. "As we implement the National Ocean Policy, remote tools such as what Dr. Hu has proposed will become increasingly important in an ecosystem-based approach to management. This product is currently in development. Please contact Dr. Chuanmin Hu (hu@marine.usf.edu), University of South Florida, College of Marine Science, for more information.